Creative Diversity Network (CDN) and Diamond broadcasters have recently reviewed Diamond in response to both new data protection regulations (GDPR), and in response to feedback about the system. Below we highlight some of the changes that we have made. In spring 2018, we updated the email which is generated by Silvermouse and which goes out to contributors inviting them to take part in Diamond. The new email provides greater clarity about Diamond, and is easier to navigate. Opting out of Diamond emails is now for an indefinite period, not just for one year. Data protection and updated privacy information. We have clarified that the name and email address of contributors is collected on the basis of ‘Legitimate Interest’ and we’ve also added information on how long data will be stored and processed. We have re-established that perceived diversity information is not normally personal data. However, it could be in some circumstances, for example if you are the sole presenter on a programme, or appearing as yourself in a cameo role. Any personal data collected in this way is processed by us on the basis that we have a legitimate interest to collect this. When the personal data is defined as special category data (relating to ethnicity, sexual orientation or disability), we process this on the basis that we believe there is a substantial public interest in monitoring how diversity is represented in the programmes shown on UK television. Data will continue to only be recorded where a characteristic is apparent on screen. The “Diversity Self-declaration Form” (DSF) is now known in information we give to contributors as the Diamond Diversity Monitoring Form as we think this is clearer for people to understand. As production companies, you will see both the old and new terms used in Diamond and Silvermouse documentation. The information provided to contributors within the Monitoring Form has also been updated to make details clearer about how and why we are processing diversity data. The way we ask for contributors to consent to their data being collected and used has been revised to reflect GDPR requirements. Our review of Diamond confirmed that the current wording used in contracts and release forms is compliant with GDPR. However, we have made some changes to provide further clarity to contributors. We ask that you amend any new contracts and release forms with the new wording as soon as you are able, to ensure that Diamond remains as clear and transparent as it can. The new wording is also available on the Pact website to its members. We have made some minor revisions to the Diamond Guidance Notes for production companies to provide additional clarity, update links to resources, and amend the Data Protection chapter where necessary. These new notes can be found on the CDN website here. For more information about Diamond visit the CDN website . 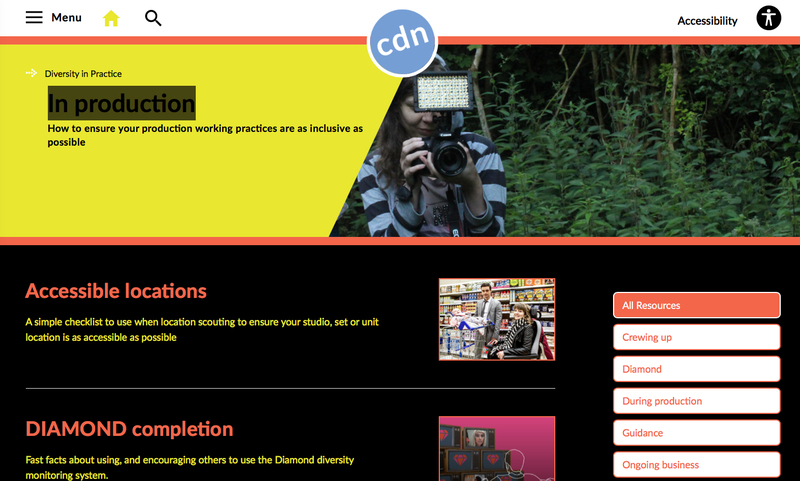 For new resources that you can pass on to contributors and agents, as well as information about how you can help to promote Diamond to your colleagues, please visit our Media Centre.